Posted by Grant Georgiades on April 24, 2015. When it comes to back and neck pain we’ve all heard the words; ergonomics, core muscles, lumbar support. They’re just a few of the pieces of jargon the health industry will throw at you. And they say the insurance brokers make things deliberately baffling?! There’s no doubt driving a vehicle for long periods of time can aggravate back and hip problems – or create entirely new ones. At Plan Insurance we are not just expert taxi insurance brokers. We are a legal organization that arranges policies for all types of professional road based businesses. We want to help reduce the number of commercial motorists suffering from chronic neck and back pain. For that reason we spoke to Brigit Brown, founder of London Brige Pilates. Using her knowledge as a Pilates instructor Brigit kindly looked into the particular stresses a professional taxi drivers’ body would endure. Spending much of the day sitting down is normal for most of us these days. Professional drivers have the added challenge of being confined to a small space with fewer opportunities to shake down. Back and neck pain are common among sitters as a result of being in a constant flexed position. It is possible to stay in shape though and it’s easier than you think. Here are some of her useful tips and advice on how to improve driving posture. If you suffer from back and neck pain already, the first thing to look at is your driving posture. As a professional driver it is critical to drive in an alert sitting position. As insurance brokers we would of course recommend that. But the biggest risk for back and neck pain is the typical slouched posture. Weight is loaded on the seat via your tail bone. This position stresses the back ligaments and discs. Added pressure is applied to them because the stomach muscles are not engaged. You don’t have to have a washboard stomach like Brad Pitt to use your abdominal muscles! Holding your head slumped forward may result in more severe whiplash injuries. If you suffer impact in the rear of your vehicle your head will have much less support! Slouching also increases the impact on the lower back from jolts when driving over poor road surfaces. Slouching whilst driving additionally impairs your safety as your ability to rotate your head is reduced. Meaning your field of vision is significantly lower! You are not only running the risk of back and neck pain. With reduced visibility you could be more likely to claim. If you lose your no claims bonus you’re likely to recieve a higher renewal premium from your commercial motor insurance brokers. It is crucial to always keep your pelvis pressed up against the back of the driver’s seat. Doing so ensures the pelvis and lower back are stable. It reduces the stress to the spine. The main reason why a driver’s pelvis will slide forward is that their seat is too far back. This leads to reaching for the pedals with fully extended legs. This causes tension in the hamstring muscles which pull the pelvis forward away from the rear of the seat. Simply move the vehicle’s seat forward so your knees are slightly flexed. A small backwards tilt to the driver’s chair (around 5-10 degrees) will provide stability. It does so by preventing the driver’s pelvis moving forward. This will help reduce the spinal stress from road shock and vibration. It may sounds melo-dramatic but fatigued muscles can increase driver reaction times. Increased reaction times in turn means that incidents occur that might otherwise have been avoided. This again makes it more likely that your insurance brokers might be sending out a higher renewal. On long drives maintaining a good driving position is especially important. Bumpy roads with bad driving posture will add to fatigue and almost inevitably lead to back pain. You need to make sure that four muscle groups are working. They are the pelvic floor muscles, the diaphragm the lower abdominals and the mid-back muscles. Talking of over-reaching of the arms – it is important to think about lowering your hands on the steering wheel. Your upper arms should hang vertically at the hip line. * A ten o’clock – two o’clock hand positions on the steering wheel results in drivers reaching with their upper arms. * This increases pressure on the spine around the rib cage. It could result in a rounded back and shoulders as well as a tense neck and upper back. Alternating between lower hand positions of 9 o’clock by 3 o’clock or 8 o’clock by 4 o’clock will help avoid this. We created these diagrams to help demonstrate a few of the issues outlined above by Brigit Brown. 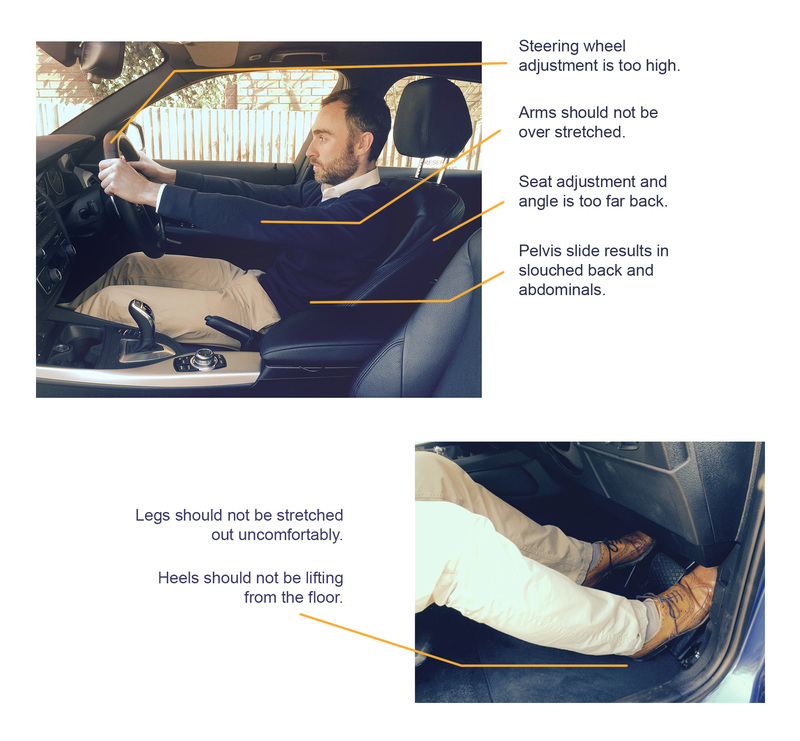 We hope these tips will assist our insurance clients’ driving posture. If followed correctly they should result in a more comfortable, healthier environment whilst going about their road based business.